As the action inside Casino de Barcelona continues to gather pace Russia's Vitaly Lunkin managed to claim the largest prize of the European Poker Tour season so far after winning the €50,000 Super High Roller. 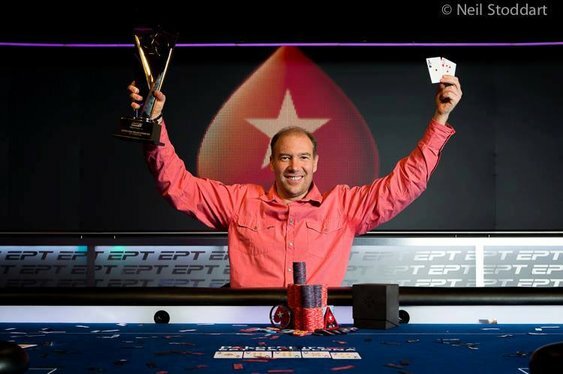 After welcoming 51 players to the felt late last week, the EPT event concluded yesterday when Lunkin managed to overcome Erik Seidel heads-up to claim the €771,300 top prize. The final session started with eight players in contention for the title but with one player guaranteed not to win any money the early action was tense. That pressure soon became too much for Timothy Adams to bear and after nursing a short stack for a number of rounds, he eventually moved all-in from the button with Ks 9s. Although it wasn't the worst hand to take a stand with, Adams' timing was off as he found himself up against Seidel's Qh Qc. A 2c 4d Kc was kind to Adams, but as the Tc and 3c fell on the turn and river the pot was pushed towards Seidel while he was left to rue what could have been. With at least €128,515 now guaranteed the eliminations began in earnest and after Germany's Fabian Quoss became the first money winner, a slew of pros hit the rail before Seidel and Lunkin were pitted against each other. Having multiple titles and years of experience between them it soon became clear that the heads-up duel would be a drawn-out affair. Indeed, as the pair battled back-and-forth Lunkin gradually edged ahead until he finally claimed the title with Ac 5h. Following Seidel's all-in with Kd Qc, Lunkin made the casual call and after the board ran out: 6s As 6c 8c 4s the match was brought to a close and Lunkin was crowned the first Super High Roller Champion of EPT Season 10.